A broad range of actors in Michigan are working together to tackle the issue of “brain waste”—the unemployment and underemployment of college-educated and professional immigrants and refugees. In many cities it is cliché to encounter the cab-driving immigrant engineer or refugee doctor waiting tables. But these examples of “brain waste” underscore real hardship for immigrants and refugees, and a real cost to the local economy. Michigan, like the rest of the Rust Belt and nation, suffers from a shortage of skilled workers—engineers, doctors, IT professionals, etc.—skills that many immigrants and refugees possess. National leaders from the New American Economy (NAE) and World Education Services (WES) Global Talent Bridge joined Michigan Governor Rick Snyder’s Cabinet Director Mike Zimmer in a summit co-hosted by WE Global Members Global Detroit, the Michigan Office for New Americans (MONA). The May 1 summit included some 75 participants from refugee resettlement agencies, workforce development agencies, immigrant and ethnic service organizations, community colleges, the Detroit Mayor’s Office of Immigrant Affairs, and local employers. In December 2016, NAE and WES joined the Migration Policy Institute in releasing the first-ever report quantifying the economic costs of “brain waste.” The report estimated that there are nearly two million highly-skilled immigrants in the U.S. working in low-skilled jobs or who are unemployed. This amounted to nearly $40 billion in lost wages and more than $10 billion in lost taxes. Global Detroit and MONA have been hard at work on these issues and the desire by national experts to release new data focused on Michigan and to discuss best practices in Detroit is a testament to our success. 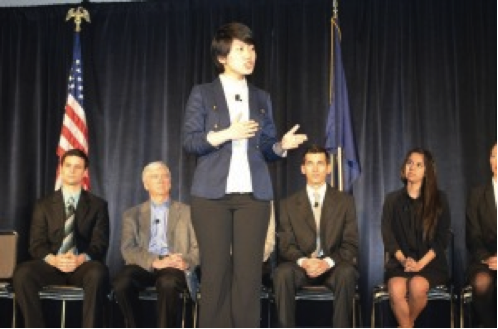 The Michigan International Talent Solutions (MITS) housed in MONA has helped to provide individual direct service to skilled-immigrants, in partnership with Upwardly Global. The average salary increase of skilled immigrants placed by the program is over $40,000. The State of Michigan also has written nearly 50 licensing and credentialing guides written for foreign-trained and educated professionals. Add to that the 124 Cultural Ambassador matches that Global Detroit has made for immigrant professionals and international students, as well as the Global Detroit Welcome Mat and other welcoming activities, and the evidence is clear that Michigan is “all-in” on this issue, according to Governor Snyder’s Cabinet Director Mike Zimmer. As I am writing this, just a couple of week after the terrorist attacks in Paris and Beirut and amid the ongoing crisis in the Middle East, I can’t help but reflect on how vital it is right now to share across cities, cultures, and countries creative solutions for integration and inclusion–for both refugees and receiving communities. These values must drive our work to restore our cities. To this end, earlier this month, WE Global Network member Global Detroit and a delegation of over 20 Metro Detroit partners visited their Rust Belt neighbors in Cleveland, Ohio to learn about how Cleveland is designing and implementing strategies to integrate and include refugees in the social and economic fabric of their community, so that they can use these insights in Metro Detroit. 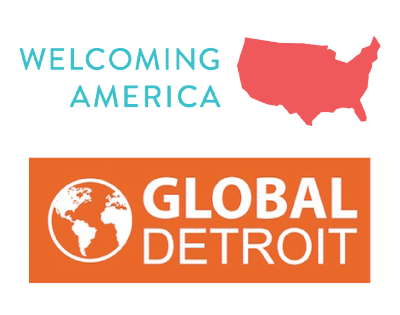 As a national leader in immigrant economic development and a founding member of the WE Global Network, Global Detroit often draws from the talent and expertise of others across the Midwest that are leading the way in inventive and unconventional strategies to foster community and economic development. The study tour included a diverse delegation of Southeast Michigan leaders and national partner Welcoming America and was hosted by new partners made through the WE Global Network. 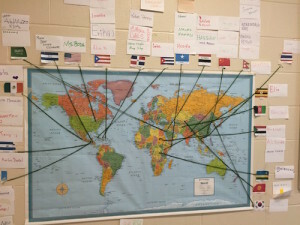 World map in a Jefferson classroom showing home country of the students in one class. On our tour, the group visited Thomas Jefferson International Newcomers Academy. This newly-constructed school in a developing neighborhood — not dissimilar to many Detroit neighborhoods and other Rust Belt cities’ neighborhoods — is unique because it services all of the English Language Learner (ELL) students in the Cleveland Public Schools. Nearly all of these students, who make up 25 nationalities and speak a total of 22 languages, have been in the U.S. for less than two years. At the Academy, the delegation was inspired by students from China, Puerto Rico, Mexico, Afghanistan, and other parts of the world who, in addition to the regular curriculum and the trials and tribulations of growing up, are learning a brand new language, far from home. Thomas Jefferson International Newcomers Academy is the anchor of Cleveland’s Dream Neighborhood – which is defined by the half-mile radius that surrounds the school. Cleveland Councilman Joe Cimperman, along with Councilmen Brian Cummins and Matthew Zone, have committed to revitalizing this neighborhood and providing new opportunities for refugees in Cleveland. They have prioritized demolition funding for the Dream Neighborhood (which encompasses 162 vacant properties), and the Cuyahoga County Land Bank has used data to identify target properties in the foreclosure process to assist in neighborhood planning and housing redevelopment. To date, this partnership has resulted in the demolition of 15 properties in Dream Neighborhood – a strong start to a brighter future in this community. A home in the DREAM Neighborhood being rehabbed by refugees, for refugees. 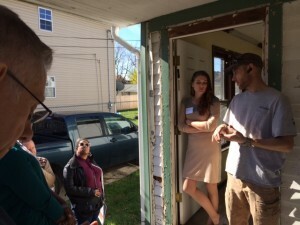 This relationship between the Cuyahoga Land Bank and municipal government is underpinned by the important role that a private developer plays in the Dream Neighborhood by purchasing, rehabbing, and renting formerly vacant homes. He also employs refugees in construction jobs to teach them valuable skills that can be translated to other jobs in the workforce. Once the houses are restored, they are rented to refugees to provide quality, affordable, safe places to live. In addition to the work done in Dream Neighborhood, Cuyahoga County Land Bank is partnering with refugee serving agencies to develop refugee housing and identify refugee tenants and homeowners who often struggle due to lack of credit and rental history. The Land Bank has worked with the International Services Center (ISC) to sell 7 single-family homes that were rehabbed into new homes for refugees. With what is estimated to be over 20,000 vacant properties in Detroit, we find ourselves sitting on an untapped opportunity to create new pathways that connect immigrants and refugees in search of housing with these vacant homes. In the second half of our study tour, attendees sat down with members of the Refugee Services Collaborative — a cross-sector of organizations joined together to better serve refugees settling in northeast Ohio. Formed in 2011, the innovative collaborative coordinates the work of its members and builds capacity across the organizations; it is comprised of refugee resettlement agencies, area school systems, and community and faith-based organizations. While not a unique concept, members point to the inclusion of a broad group of entities and the level of collaboration, and the hiring of a third party facilitator as reasons for their success. In 2012 the Collaborative published a groundbreaking economic impact study of refugee resettlement in Northeast Ohio, which found that refugees have helped slow population loss and have had an economic impact of $48 million. An economic development approach to their resettlement efforts has further propelled their work and opened doors to new relationships, sectors, and strategies. In the wake of the attacks on Paris and Beirut, Global Detroit and its friends and partners in the WE Global Network continue to develop comprehensive and streamlined systems to receive, include, and empower more refugees. The study tour to Cleveland left the Global Detroit team and its partners with a strong sense of direction, inspiration, and partnership to navigate refugee resettlement in Detroit and the region. The delegation will be applying the tools in Detroit to develop innovations that integrate and include refugees and immigrants as valued contributors to Southeast Michigan’s cultural, civic, and social fabric. Global Detroit thanks its friends and generous hosts – including, Samantha Peddicord of Cleveland City Council Representative Joseph Cimperman’s office, Gus Frangos and Lilah Zautner of the Cuyahoga Land Bank, Danielle Drake of US Together, Darren Hamm of Refugee Response, and Richard Konisiewicz of Global Cleveland – who made the trip to Cleveland a huge success! Skyin’s journey to her current position as the Communications and Experiential Learning Coordinator at the Office of International Students and Scholars at Michigan State University wasn’t always easy. 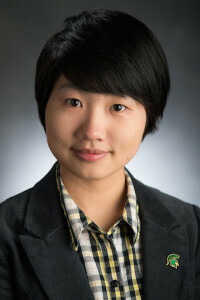 With the help of the Michigan Global Talent Retention Initiative, one of the nation’s only international student retention programs, Skyin was able to work for Message Makers, an award-winning global event planning, video production, and instructional design company in Lansing, accessing the Optional Practical Training (OPT) benefit of her international student visa during her first year after graduation. She was even a featured speaker in Michigan Governor’s Talent Summit (see picture below). At Message Makers, Skyin provided valuable insight into Chinese markets and customers, as well as contributing to the company’s local work. The firm valued her contributions so much that they paid a lawyer and accompanying filing fees to secure an H-1B visa for Skyin to extend her employment, but unfortunately, like for most applicants, the application was rejected because of the high demand for H-1B visas. Fortunately for Skyin and Michigan’s economy, Skyin learned of an opening at Michigan State University (universities are exempt from the H-1B cap) and after multiple rounds of interviews, Skyin was offered the position. As a result, the University would file a new H-1B petition on her behalf and she would be allowed to continue working in the United States. She is now a contributing taxpayer to the Michigan economy, and enriches her community and the social contours of the region through the network of friends and neighbors she built during her time in Lansing. In addition to enriching cultural and academic exchange and internationalism at universities and colleges, international students have a significant positive economic impact on the local communities where they study. NAFSA, the Association of International Educators, estimates that their tuition, fees, and living expenses meet the technical definition of an export product and collectively account for more than $24 billion of consumption on an annual basis, supporting 313,000 jobs as a result of this spending. 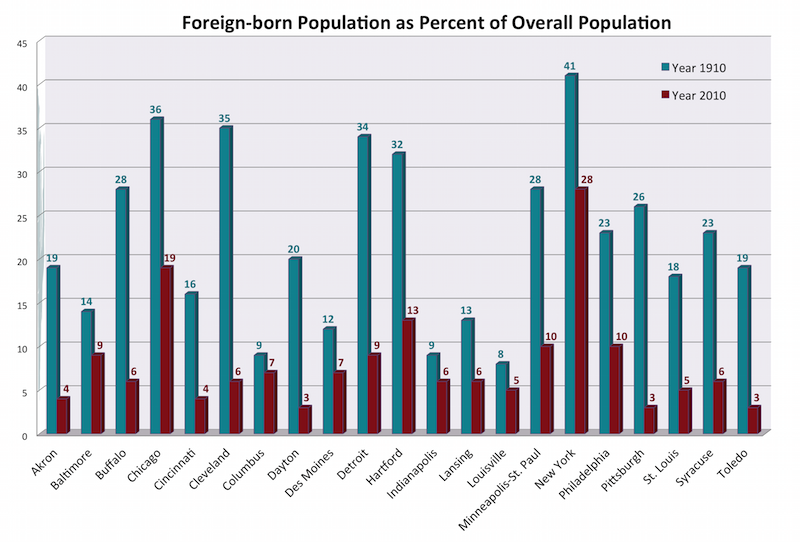 The Ohio Board of Regents is not far behind, recently issuing a report that contends boosting Ohio’s retention of international students to national averages would “generate almost $100 million in the state’s economy and support more than 1,000 new jobs.” The Board of Regents is working with Governor John Kasich and the local economic development infrastructure to design and implement an international student retention program. The St. Louis Mosaic Project, a regional initiative to capitalize on the economic benefits of increasing the foreign-born population, runs a Global Talent Hiring Program focused on six strategies to help the region retain international students. The program includes engaging both the international student services and career services offices of eight local universities, along with the Regional Business Council, to share best practices and identify collaborative opportunities. In September 2015, St. Louis Mosaic worked with a local university to publish a report on international student retention that included seven specific strategy recommendations. Welcoming America’s Guide to Immigrant Economic Development contains a chapter that chronicles the economic opportunities that international student retention can create, as well as eleven other strategies employed by local immigrant economic development initiatives across the country. It is the first guide detailing the economic development opportunities and strategies for local economic development leaders, public policymakers, chambers of commerce, immigration advocates, nonprofit organizations, philanthropic leaders, and others who want to build a more prosperous and inclusive economy. You can download your free copy of the guide here. Are you looking to start an initiative to spark growth in your city and local economy by better integrating immigrants and the skills, entrepreneurial spirit, talent, and energy they bring to local economies? Or maybe you want to enhance an existing immigrant economic development effort? Welcoming America’s new Guide to Immigrant Economic Development provides guidance for building or growing a regional infrastructure to welcome, support, nurture, and integrate immigrants and refugees in your region in a manner that can both create more meaningful opportunities for immigrants and refugees, and that can provide tangible benefits and opportunities to receiving communities. This guide showcases the role immigrants play in economic growth, job creation, and prosperity for their community. Chapters contain best practices, strategies, and models that can inform those working in the fields of economic development and immigrant integration. The Guide responds to the growing demand from communities looking to start or enhance an initiative to spark growth in their city and local economy by better integrating immigrants and the skills, entrepreneurial spirit, talent, and energy they bring to local economies. As more communities in the Rust Belt recognize the value of immigrants to their local economies, this guide can provide a framework to help them develop their own initiatives based on their local needs and infrastructure. 100 years ago, the Rust Belt was a region of immigrants – a global leader that attracted millions of people from all over the world to contribute to the growth industries of America’s manufacturing base. Immigrants were at the source of much of the Rust Belt’s early 20th Century industrial innovation and propelled much of America’s industrial growth. Their economic contributions helped build the most prosperous middle-class quality of life the world has ever known. Can you imagine how energized Rust Belt cities would be if their populations reflected anything like the number of newcomers we experienced 100 years ago? See the chart below comparing 1910’s foreign-born populations to 2010’s in our WE Global Network member cities. The WE Global Network is a collection of 20 Rust Belt economic and community development initiatives focused on revitalizing their cities and regional economy by integrating immigrants. The WE Global Network celebrates Immigrant Heritage Month, a nationwide effort coordinated by Welcome.US to gather and share stories of our shared American heritage, by honoring immigrants’ economic contributions and encouraging a new future in the Rust Belt that welcomes and embraces immigrants, refugees, and internationals. When talking about immigrant business owners, it’s common to think first of your local corner store, family owned-restaurant, and other small businesses we rely on in every day life. Less often do the well-known logos of the household brands that provided livelihood to our grandparents’ and parents’ generations come to mind, but we now know that many of these companies, too, owe their existence to immigrant innovators. Entrepreneurial immigrants have created some of the world’s largest companies and millions of jobs for American workers. The Partnership for a New American Economy’s “New American” Fortune 500 report explores the latest research on the business contributions of immigrants. Nationally, more than 40% of 2011’s Fortune 500 companies were founded by immigrants or their children. These companies employ 10 million people worldwide, and have combined annual revenues of $4.2 trillion, an amount greater than the GDP of every country in the world but the U.S., China, and Japan. To celebrate Immigrant Heritage Month, WE Global Network partnered with the Partnership for a New American Economy to examine the contributions immigrants have made to our 10-state region’s largest companies. The numbers are astounding. 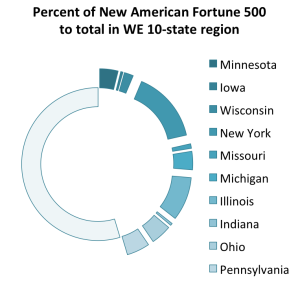 “New Americans” (defined for this purpose as an immigrant or the child of an immigrant) in our WE Global Network 10-state region founded 94 of the Fortune 500 companies (2011 data) – that’s nearly one out of every five of America’s largest companies. 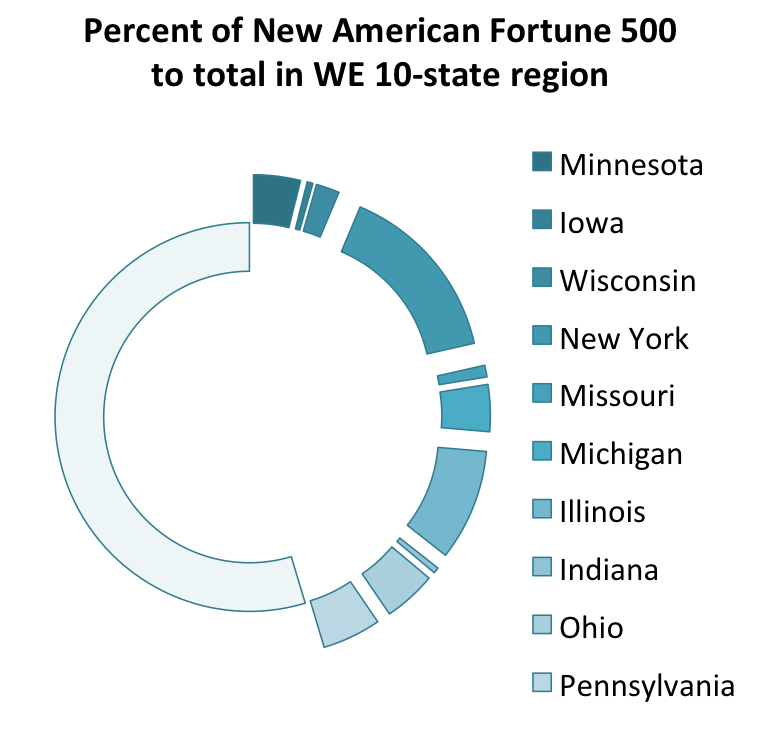 Furthermore, a New American founded nearly half (45.6%) of the Fortune 500 companies in our 10-state region. And finally, the 10 WE Global states account for 45% of all the New American Fortune 500 companies. Across the Rust Belt, economic development initiatives and innovative strategies focused on attracting and empowering immigrant communities have taken root. The WE Global Network was formed to connect these efforts and to honor and embrace the Rust Belt’s legacy as a region of immigrants. In many ways, the first step to empowerment is recognizing the strength of our heritage. Our immigrant ancestors were a main source of our economic strength in the 20th Century, and new immigrants to the United States have continued this tradition into the 21st. Immigrant Heritage Month celebrates immigrant contributions from the past and present through stories and events nationwide. We encourage you to read the inspirational immigrant stories on the Welcome.us website and share your story too! You can also promote and participate in events happening near you and share the stories through Welcome.us’ Facebook, Twitter, and Youtube. Buffalo – Mayor Byron Brown recognized June as Immigrant Heritage Month, and World Refugee Day Kicked Off With A Soccer Game At LaSalle Park. Cleveland – Through Global Cleveland’s Welcoming Initiative, old and new friends participated in a walking tour through the Cleveland Cultural Gardens on June 12th. On June 13th, Global Cleveland participated in La Placita Market in Cleveland’s Clark-Fulton neighborhood on the city’s west side – a traditional Hispanic market aimed at promoting the neighborhood’s Hispanic culture and fostering economic development. Global Cleveland held a private viewing for guests of a documentary featuring stories of recent immigrants to the United States. Global Cleveland wraps up their celebration with their monthly international meet-up dinner at Luchita’s Mexican Restaurant to celebrate Cleveland’s diversity – and amazing Mexican food. Check out Global Cleveland’s IHM stories! Columbus – The City of Columbus recognized Immigrant Heritage Month with City Council. Philadelphia – The Welcoming Center for New Pennsylvanians launched a 3-week campaign to share the Welcoming Center’s stories and raise funds to support new arrivals to establish themselves in America. Pittsburgh – All month long, Vibrant Pittsburgh has been sharing stories of immigrants in the Pittsburgh community, and created a series of videos highlighting the diversity in the region. Vibrant Pittsburgh also funded Pittsburgh’s World Refugee Day, and captured some of the fun! On June 1st, the City of Pittsburgh kicked off Immigrant Heritage Month with a special visit from USCIS Director León Rodríguez and an historic naturalization ceremony in City Council chambers, followed by the announcement of Mayor William Peduto’s Welcoming Pittsburgh Plan. Pittsburgh also launched their Spark! Film Series early this month, expanding their Cinema in the Parks free summer screenings to include six cultural films–previously only one cultural film was shown–in the hopes to spark an engaging community dialogue. Pittsburgh continues the celebration of Immigrant Heritage Month by inviting the public to City Hall to experience the journey of an undocumented immigrant in the Shared Border, Shared Dreams exhibit. Pittsburgh is excited to round out the month with the City’s first-ever Citizenship Day, to support Pittsburgh’s citizenship-eligible residents on their path to naturalization. St. Louis – Anna Crosslin of the International Institute St. Louis was honored Thursday by The White House as a “Champion of Change” – people who are making a difference in the lives of ‪‎refugees in the U.S. and abroad. Anna has served as President and CEO of the International Institute of St. Louis for 37 years, and was instrumental in the founding of the St. Louis Mosaic Project, a nationally-recognized multi-sector led immigration attraction initiative and WE core member.